Good news from Bob Cury at RJC Yachts as he sends word that he acted for the buyer in today's sale of Feadship's 48.77m motor yacht Major Wager, a central listing with Stuart Larsen at Fraser Yachts. She was delivered by the Van Lent yard in 1988 and was most recently refitted in 2008. Her Glade Johnson interior features outstanding woodwork and she has great deck spaces and easy water access, plus a helicopter platform. Complete with a vast range of water toys, Major Wager accommodates 10 guests in a master, two VIPs and two doubles. 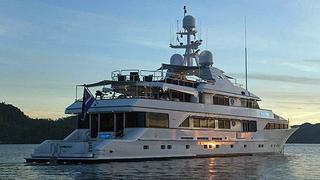 The asking price was $13.9 million and she's now been renamed Mysorah.